a device to help first responders identify stroke and triage patients to the right hospital. Nearly half of US stroke patients are triaged to the wrong hospital. A significant reason for this is the lack of objective tools to screen/identify victims. 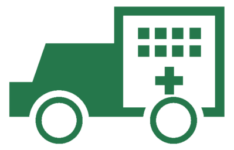 The process of transporting a patient between hospitals delays the appropriate life saving treatment for approximately 110 minutes. This added time significantly increases the chance of complications, death and disability. Given current accuracy rates, nearly 300,000 patients experience avoidable delays in the gold-standard of stroke care. ALPHASTROKE enables first responders to quickly detect and triage stroke, so they can route the right stroke patients directly to the stroke treatment centers rather than hospitals ill-suited for the patient's needs. Stroke intervention is time limited and earlier interventions are more effective. By increasing the number of stroke victims who receive early treatment, ALPHASTROKE could dramatically improve patient outcomes. Early treatment can prevent up to 6,000 deaths and 300,000 hospital days per year, as well as enabling tens of thousands of patients to walk without assistance and avoid dependence on assisted living facilities or nursing homes. By achieving a high sensitivity and specificity, ALPHASTROKE can reduce avoidable delays in care by more than 75% and reduce patients sent to higher levels of care by ≥50%. Interested in seeing the ALPHASTROKE? Please contact us through the Contact Page and we will respond to you promptly.